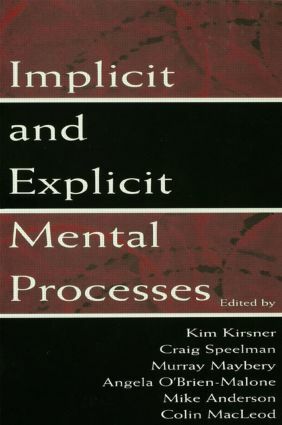 The need for synthesis in the domain of implicit processes was the motivation behind this book. Two major questions sparked its development: Is there one implicit process or processing principle, or are there many? Are implicit memory, learning, and expertise; skill acquisition; and automatic detection simply different facets of one general principle or process, or are they distinct processes performing very different functions? This book has been designed to cast light on this issue. Because it is impossible to make sense of implicit processes without taking into account their explicit counterparts, consideration is also given to explicit memory, learning, and expertise; and controlled processing. The chapter authors consider principles, processes, and models which stand above a wealth of data collected to evaluate models designed specifically to account for data from a specific paradigm, or even more narrowly, from a specific experimental task. The motivation behind this approach is the proposition that modeling is possible for a much broader data domain, even though there may be some cost where specific tasks are concerned. The aim of this book is to treat synthesis as the objective, and to approach this objective by collecting and discussing phenomena which--although they are drawn from diverse areas of psychological science--touch a single issue concerning the distinction between explicit and implicit processes. "It is an extremely valuable collection as an informed discussion of the topic and as a record of the evolution of a phenomenon in psychology, both clinical and experimental. Upper-division undergraduates and above." Contents: Part I:Introduction. K. Kirsner, C. Speelman, Introduction and Overview. K. Kirsner, Implicit Memory. A. O'Brien-Malone, M. Maybery, Implicit Learning. C. MacLeod, Implicit Perception: Perceptual Processing Without Awareness. C. Speelman, M. Maybery, Automaticity and Skill Acquisition. J. Dunn, Implicit Memory and Amnesia. P. Roberts, Implicit Knowledge and Connectionism: What Is the Connection? Part II:Theory. C. Speelman, Implicit Expertise: Do We Expect Too Much From Our Experts? M. Maybery, A. O'Brien-Malone, Implicit and Automatic Processes in Cognitive Development. M. Anderson, Individual Differences in Intelligence. C. Speelman, The Automaticity of Discourse Comprehension. K. Hird, K. Kirsner, Control Processes in Prosody. D. Nesdale, K. Durkin, Stereotypes and Attitudes: Implicit and Explicit Processes. C. MacLeod, E.M. Rutherford, Automatic and Strategic Cognitive Biases in Anxiety and Depression. C.D.L. Wynne, A Natural History of Explicit Learning and Memory. Part III:Application. K. Durkin, Implicit Content and Implicit Processes in Mass Media Use. D. Milech, M. Finucane, Decision Support and Behavioral Decision Theory. D.L. Morrison, P. Lee, Mixed Processes in Process Control. T. Griffin, S. Schwartz, K. Sofronoff, Implicit Processes in Medical Diagnosis. J. Fletcher, C. Roberts, Intellectual Disabilities. W.E. Tunmer, J.W. Chapman, Implicit and Explicit Processes in Reading Acquisition. Part IV:Synthesis. S. Lewandowsky, Implicit Learning and Memory: Science, Fiction, and a Prospectus.